Please register for the talk here! Palestine/Israel is often described in a sequence of battles or ‘clashes’ regarding ideology, land, violence, economy and international relations. In the media and beyond, these overshadow the everyday experiences of structural or bureaucratic violence. Through a visual tour and narrative presentation, Nadia Abu-Zahra shares her work (completed with Adah Kay) chronicling how millions of Palestinians have been denationalized through the bureaucratic tools of census, population registration, blacklisting and a discriminatory legal framework. Based on first-hand accounts and extensive fieldwork, the presentation shows how identity documents continue to be used as a means of coercion, extortion, humiliation and informant recruitment. The violence of bureaucracy, however, is resisted by Palestinians, Israelis and internationals who refuse to be displaced and divided, to be bound by movement restrictions, and to accept the structural injustice of ‘systematic oppression’ (a term used in international law). 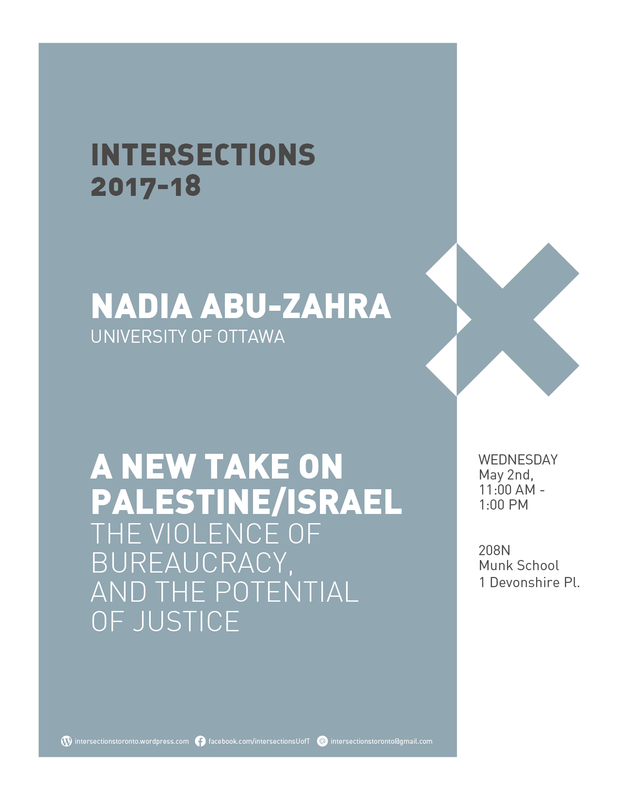 Dr. Nadia Abu-Zahra is Associate Professor of International Development and Global Studies and a member of the Human Rights Research and Education Centre at the University of Ottawa. She also serves on the Reconciliation Committee of the Canadian Federation for the Humanities and Social Sciences. She was previously based at the University of Oxford, and has worked on projects for Oxfam, UNICEF, the European Union, the Open Society Foundation, and Global Affairs Canada. As co-Director of Community Mobilization in Crisis — a project to extend higher education to host and refugee communities through blended/distance learning — her collective efforts have garnered several awards. Co-sponsored by: the Munk School and the Department of Geography & Planning.